We all need shorts now, eh? Now that the weather has turned in the western hemisphere. Another winning slice of electro-pop from George Lewis Jnr, making a certain part of the 1980’s relevant again. The part that was mined by early Tears for Fears or Talk Talk, a little bit. Great rhythm guitar work under the synth melody and a vocal full of conviction and emotion are sure to make this a hit with all intelligent dancefloors. Speaking of Bon Iver, Ryan Olsen and Channy Leanagh are regulars from the Justin Vernon coterie. This second track from their upcoming Give you the Ghost album features the same signature auto-tuned vocals, but used in a way so different to Cher as to render the comparison redundant. Unlike the previous Lay your cards out, there’s a driving synth pulse here, and even behind the filter, Leanagh’s delivery manages to be intriguingly laconic and unsettling at the same time. Wonderful stuff. Tom Krell’s new material with an album on the way in the autumn. Lush, slowed down, slightly warped RnB, with celestial Bon Iver-esque banks of vocals. Haunting and very, very lovely. *Thank you to my UCC 98.3FM colleague Jim Morrish for pointing me in the direction of this. From the endlessly nurturing source that is the wonderful LITA, another hidden pop gem unearthed from a time when punk and disco were going head to head. I’ve seen the phrase “bedroom pop jam” used in connection with this and it’s a good starting point. Two brothers in rural Oregon, funded by their farming father, producing the sweetest blue-eyed soul. You can see why Ariel Pink would be into it. We've already mentioned Jherek Bischoff's wonderful new album, Composed, on Leaf this side of the Atlantic (Brassland in the U.S.). A new video has just seen the light of day for the track Young and lovely, which features guest vocals from Zac Pennington (of Parenthetical Girls) and Soko. The tune is a brilliant, head-spinning combination of fast-paced sections with swooning string flourishes, and brass band style waltzes. Here's a little background on the video from the director. One of our favourite labels, the Perth-based Hidden Shoal, is 6 years old this month. I'm not sure if the term 'boutique' applies, but there's certainly a care and attention to detail about everything they do that is very satisfying. And as if to take this approach to a new level, label manager Cam Merton has post-produced and edited the new video for Inventors by Kramies. That's the centrepiece of Kramies' recent EP The European (full name Kramies Windt, he's Dutch originally, but domiciled in the US for some time), from which we featured several tracks on the show when it came out, and which was produced by regular Guided By Voices collaborator Todd Tobias - more about him later in the month. Inventors is a lovely, leisurely slice of dream-pop, blissed out and shimmering. Happy Birthday Hidden Shoal, keep doing what you're doing. 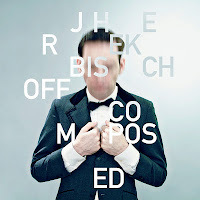 There are several reasons to love Jherek Bischoff's new album, Composed. Firstly, it's on The Leaf Label, who are on a particularly hot streak this year, following two stunning releases already from Matthew Bourne and AU. Secondly, it features guest contributions from David Byrne, Caetano Veloso, Nels Cline, Carla Bozulich, Zac Pennington and Soko, among others, all of which are sparkling and vibrant. But thirdly, and most importantly for me, it occupies the musical area known as chamber pop. You know we love a bit of chamber pop around here. This is a swooping, fluttering, brilliantly orchestrated album of tunes which recalls Van Dyke Parks at his best. I'm not going to say any more for now because I'm still digesting its multi-faceted gorgeousness, but there'll be loads more on the radio show from this in the near future.